Before I describe our study’s results, let me explain a little about how biologists can reconstruct the characteristics of extinct species using what we know about living ones. First, we use DNA data to reconstruct evolutionary relationships between our favorite living species—this gives us an evolutionary tree, or phylogeny, like the ones in the illustration below. A phylogeny diagrams the branching evolutionary history that led to the living species at the tips of the tree. If we map the different states of some character that all those species have—say, the color of their feathers, onto the tips, we can infer what the ancestors at each of the inner branch points might have been like. For instance, consider the possible scenarios for species A, B, C, and D in the illustration below. In the first case, if A and B are both red, then their common ancestor was probably red, too. However, C is blue—what does that mean for the common ancestor of C, A, and B? Because D is blue, we infer that the common ancestor of C, A, and B was also blue, as was the common ancestor of all four species. This is the most parsimonious reconstruction—it minimizes the number of times that color changes in the evolutionary history of the four species. 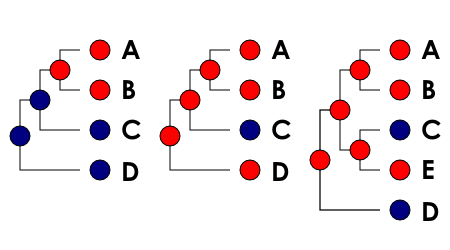 In the second scenario, species D is red, so the same logic infers that the common ancestor of A, B, and C was red. In the third scenario, adding another red species (E) to the tree might also alter the most likely character states for the ancestral species on the tree—but this depends on where the DNA suggests that the new species fits on the tree. Most modern reconstructions of ancestral character states are more statistically complex than what I’ve just described, but the underlying logic is the same. 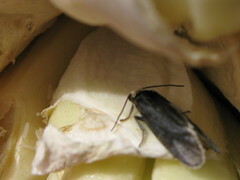 What did the ancestors of yucca moths do for a living? A small sample of Prodoxid diversity: Greya politella (above) and Tegeticula synthetica (below). (Photos by jby). The genus Lampronia, which lay eggs in another wide assortment of plants. 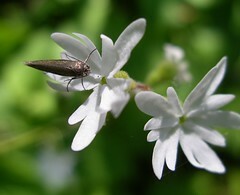 This diversity offers some intriguing possibilities—depending on how these genera are related to each other, the moths that would colonize yuccas and evolve obligate pollination mutualism might have lived on anything from roses to saxifrages, and their larvae might have eaten leaf tissue, woody twigs, fruit, or flowers. 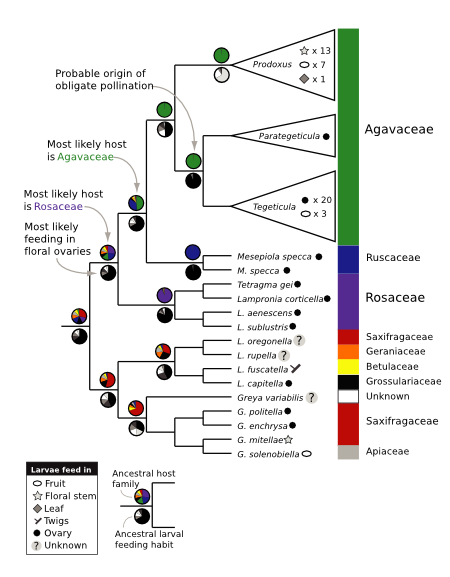 However, the last study to reconstruct the evolutionary relationships among these groups included only one species of Lampronia, leaving a number of current host plant associations and larval feeding habits unrepresented. So we collected new DNA sequences from another dozen species in the genus Lampronia, reconstructed their relationships to the rest of the Prodoxidae, and used the resulting phylogeny to estimate the host plant association and larval feeding habit of the ancestral species that gave rise to the yucca moths. The results are presented in the large, color-coded figure below. Interpretation of this figure is similar to the example I gave above, except that the reconstruction method we used allows us to estimate the relative probability of each character state at the ancestral nodes, which we present in color-coded pie charts. This gives us a better picture of the evolutionary changes in the lineage that would become yucca moths. The ancestral moths probably fed inside floral ovaries all the way back to the origin of the Prodoxidae. Before colonizing woody monocots (the Agavaceae, the family including yuccas, and possibly the Ruscaceae, the family fed on by Mesepiola), they most likely fed on plants in the rose family. This reconstruction gives us the best picture we’ve had to date of the conditions under which yucca moths evolved obligate mutualism—before they were active pollinators, the moths were already feeding inside developing flowers. This suggests that active pollination evolved to help ensure a larval food supply. We might imagine, then, that plants used by these pollinating seed parasites would evolve greater dependence on their highly efficient pollen delivery, moving toward the yucca-yucca moth mutualism we see today. Update, 1017: Just realized I scheduled this post without adding a link to my interview with Chris Clarke, which covers the results of this paper from a rather different angle. This entry was posted in evolution, my research, science and tagged RB Editors Selection, Research Blogging, shameless self-promotion, yucca moth by jby. Bookmark the permalink. Hi Jeremy, really enjoyed this post. Learnt about this as an undergrad so its neat to actually see how things are developing. 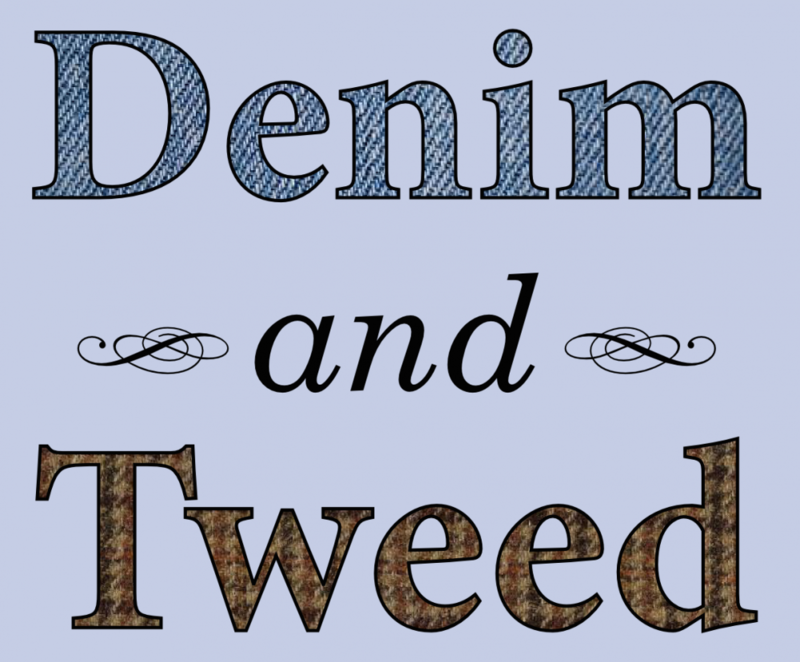 I mentioned your blog on my website, I’ve just stumbled upon it and its really good reading. Well, thanks, Simon! It’s always nice to run across folks who know yucca moths.